Recently remodeled beach house on Lake Michigan. Large west facing deck complete with furniture and new gas grill - great place to watch the beautiful sunsets over the lake. Two acres of beautiful property on a 100 foot bluff overlooking Lake Michigan.Large mowed yard perfect for playing frisbee, soccer, etc... surrounded by trees, and,there's a great tire swing. Stairs from the property (approx.200) lead down to large private beach (200 feet of beach). Plenty of driftwood around for bonfires. Walk for miles either north or south. Search for beach treasures. Quiet surroundings. Our rental rate includes all fees and taxes. Enjoy the shops and great restaurants of Saint Joseph. Plenty of fresh fruit stands, farms, and local wineries with great wine within minutes to visit and enjoy. This is the perfect place to relax and escape. No pets or smoking, please. One large bedroom with a double bed - upstairs. One med. sized bedroom with a double bed - upstairs. One small bedroom with two twin beds - upstairs. One large bedroom with two double beds - downstairs. One med. sized bedroom with a queen bed - downstairs. Hi! I am Jodie Nettelhorst. My husband and I have owned this house and property since 2000. My family has been vacationing in Southwest Michigan since I was young. My mom owns the house and property next door but it just wasn't big enough now that my siblings and I have families of our own. So, my husband and I bought this property so we could have more room for more people to visit and vacation together. My siblings and I look forward to the whole family getting together one week in the summer for our reunion, no matter where in the world everyone is living. We do our best to maintain and improve our property by reinvesting our profits every year. We work to create and maintain a safe, fun, comfortable place for our family and other families to relax and enjoy. We enjoy it when other families can come and share in our special place on the lake. My family has been enjoying vacations in Southwest Michigan all my life. We started vacationing in New Buffalo. As it got more crowded, we moved up to the St. Joseph area. Around 1990, my mom bought her first vacation house in the area on Lake Michigan. It is beautiful property but as my siblings and I married and had kids we outgrew the house. In 2000 my Mom's neighbors wanted to sell. We ended buying the house and property and now have plenty of room for our families to gather, and, plenty of room to share when we can't use it. We have a large, secluded lot. It has two acres of mowed, grassy yard space. The house and property are on a bluff overlooking Lake Michigan. The sunsets are spectacular and the lake is your western horizon. We try to keep the house as comfortable and carefree as possible. That's the way we like it when we go on vacation. 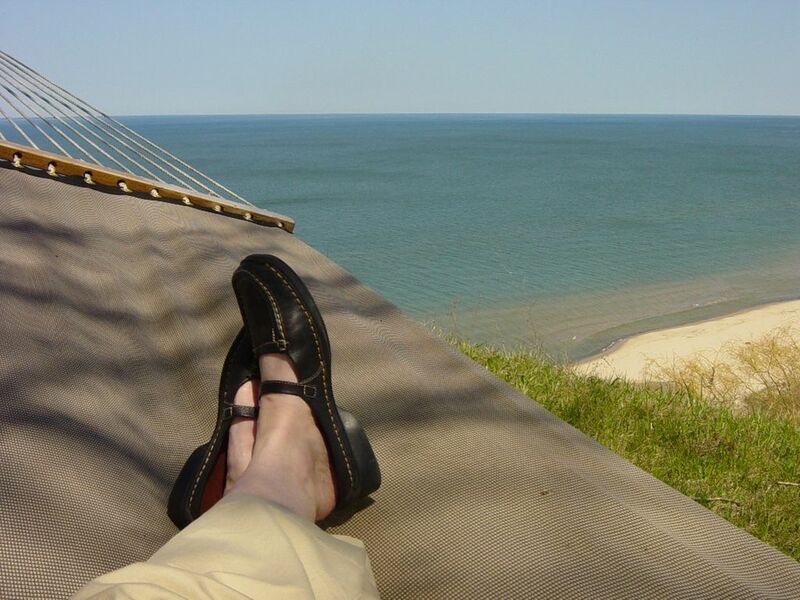 Sit or stand along the edge of the bluff for a gorgeous panoramic view of the beach and Lake Michigan. Beautiful large, private, sandy beach at the bottom of the steps. We keep tables, chairs, and umbrellas on the beach for guests to use. Our property is on the shallow, sandy shore of Lake Michigan. Beautiful inside! We loved having a table that sat at least 10 and a very comfortable living room. The openness of the house was conducive to chatting and relaxing. The view of the lake was gorgeous and we enjoyed taking the 223 steps down to the beach for a wintry walk. The place was clean and comfortable with a nice kitchen. The beds were comfy but a little too soft. Our party of 8 (one toddler) enjoyed it a lot! Very large, clean property with many things to do. We stayed for two nights for our daughters wedding. Plenty of bedrooms and bathrooms for everyone. Loved the large kitchen table and family room. There was a large selection of board games for you to play. We could not have ask for a better place. Thank you so much. We love the location. All the privacy of the country with a short drive into town. Fires on your own private beach. Large yard for outdoor summer activities. House accomadates many family and freinds. Great place for poping up a tent if you need more room to house extra guess. Family and freinds can come and go to futher enjoy the quaint little shops just seven miles away. A great way to enjoy the company of blended families with fun and celebrations. This is our second year coming here to celebrate the 4th of July. Will probably make it a family traditon. This property was amazing. We hosted a wedding in town and the wedding party utilized this house and the house next door. I would never have imaged what kind of tone this location would have set for a casual family gathering. When first parking at the property we thought we were in the wrong location. Once entering the houses we were extremely pleased at how we could see this was going to be the perfect setting for us. The property is beautiful. The houses are clean and comfortable and equipped with anything you could need. The view of the lake is amazing. There are a lot of steps to the lake but so worth the climb down and up. There is a tire swing for the kids. Campfires for all and a wonderful deck and swing to sit and watch the sun set. The property owner was helpful and informed us of everything we needed to know. Thank you for a sharing your homes with us. We hope to bring our families together again and would certainly do it here. We love this place. It is a wonderful place for a family vacation. We've gone for several years now and plan to return. We've taken our children and our grandchildren and they think it is great fun. ******Monthly rentals from November - April $1,000 - $1,500 per month. ******* * Reservation Deposit required ($300). * Reservation deposit is refundable only if we find other renters to fill the reservation. * Reservation Deposit becomes a Security Deposit during rental period.